1. Helen Beatrix Potter was an English author, illustrator, natural scientist and conservationist best known for her books featuring animals. Are you familiar with this author? 2. 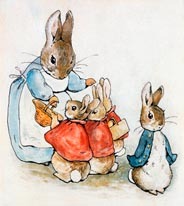 Just recently a publisher found an unpublished Beatrix Potter handwritten manuscript in a school notebook, the story features an older Peter Rabbit and a well-behaved black cat and is called 'The Tale of Kitty-in-Boots. Would you be interested in reading it when it is published. Yes, I would love to check this book out. No, it wouldn't be for me. 3. If you are familiar with Beatrix Potter which of the following books have you read? 4. Are you aware of any of these Beatrix Potter facts? Beatrix and her brother kept several small animals as pets, at various points she had mice, rabbits and a hedgehog. One of her rabbits was called Benjamin Bouncer. She published 23 books in the 'Tales of' series. She loved living in the country and in 1905 bought Hill Top Farm in the Lake District. When she died in 1943 she left all her property to the National Trust who opened her farm to the public in 1946.